Muscadelle is often used a blending grape in Sauternes for the production of the famous sweet, white Bordeaux wines. 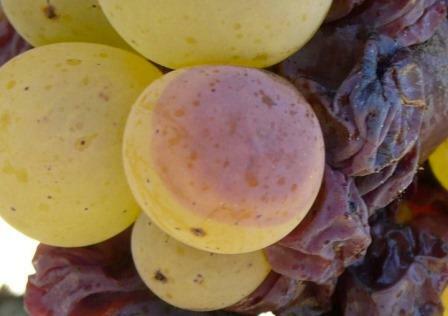 Once attacked by Botrytis, the fruit is used as a minor part of the blend, along with Sauvignon Blanc and Semillon. Not many producers use it in their blends. Those that do, use very little. The addition of Muscadelle can contribute floral characteristics to a wine. With the exception of the Barsac estate of Chateau Broustet, who maintain plantings of 12% Muscadelle, the few estates that use the grape, usually limit to between 1% and 3% of their vineyard in Bordeaux. One small Bordeaux estate actually produces wine made from 100% Muscadelle grapes, Chateau Bertranon, which is sold as a generic AOC Bordeaux. Muscadelle has slightly more popularity in the blends for sweet wines from the Bergerac and Monbazillac appellations. Some producers in the Entre Deux Mers appellation use a small amount of Muscadelle in the blends for the production of their dry, white Bordeaux wine. In Australia, the grape is planted under the name of Tokay, where it develops a distinctive raisin personality. That unique characteristic is prized for use in the fortified wines produced by numerous estates in the Rutherglen and Glenrowan appellations. Chambers, RL Bueller and Trevor Jones are a few of the top producers to seek out. Many of the best Muscadelle based Australian wines are non vintage blends that include wine from various vintages that are 50 years or older. At one point in time, those wines were sold as Australian Tokay. However, that practice was stopped in 2007 to help avoid issues with the famous, sweet white wines of Hungary from Tokaji. From that point forward, the were marketed as Topaque. These intense sweet wines are an acquired tasted that I admit, I am never going to acquire. Muscadelle as a wine and food match best with a variety of salty cheeses, nuts and different breads. It can also make a good food and wine match with foie gras, depending on how the foie gras was prepared. Due to its intense, naturally sweet nature, Muscadelle can be too sweet to pair with most desserts. That is unless you have a very, serious sweet tooth!